A man was left seriously injured in Hamilton early today after he was chased by men armed with weapons who tried to kill him. The 48-year-old victim needed emergency surgery at Hairmyres Hospital after the targeted attack, which happened in the town’s Comely Bank. The incident was reported to police at 2.45am, and police are treating it as attempted murder. 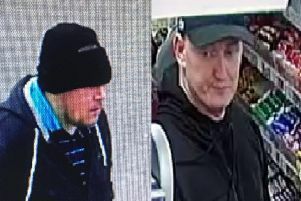 The first suspect is described as, male, between 5ft 8ins and 5ft 9ins tall, slim build, and wore a dark coloured hooded top, dark coloured bottoms and dark coloured shoes. The second suspect is: male, around 5ft ins to 5ft 7ins, slim build, and wore a dark coloured hooded top, dark coloured bottoms and light coloured shoes. Officers have been carrying out door-to-door enquiries and are gathering CCTV footage in a bid to gain vital clues. Detective Sergeant Ronnie Douglas said: “We are in the process of piecing together the circumstances of what has happened. “We need to establish the motive for this attack which has left a 48 year-old man seriously injured. “I am appealing to people in the local community to contact us. “Did you hear shouting or any kind of disturbance, did you witness the attack, or perhaps you saw the two suspects run off. “If you have any information, even if you think it’s not important, please pass it on to officers. “Your information will be followed up and could prove vital in the investigation and in locating the people responsible for this violent attack. “Additional officers will be patrolling the area to reassure members of the public. Anyone with information is asked to contact officers at Cambuslang police station via 101, quoting reference number 0688 of the 1 July 2017.